Provides a popdown list of items which can be selected. Multiple selections are allowed. Compared the Dropdown control, it acts more like other Input controls, with a header and a footer. Dropdown acts more like a button and does not allow multiple selections. Note: Changes were made to the Bootstrap 4 version of this control, starting with AppStudio 7.2. .value now saves the internal value for the item. addItem(text, value, selected, disabled) Adds an item with text and value to the end of the list. 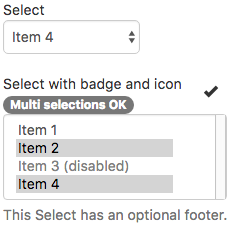 selected and disabled are booleans. Runtime. See Note above about important changes. clear Clears all items. Runtime. multiSelect Can multiple items be selected? Design Time. size Maximum number of rows to display. Default is 1 (4 if multiSelect). Design Time. item Gets or sets the number of the current selection, starting from 0. If setting, the item needs to exist as a choice already. If multiple items selected, value returns an array. Run Time. See Note above about important changes. text Gets or sets the text of the current selection. If setting, the text needs to exist as a choice already. If multiple items selected, value returns an array. Run Time. See Note above about important changes. value Gets or sets the value of the current selection. Use this to keep additional information about the item, like an index number. If multiple items selected, value returns an array. Cannot set multiple selections. Run Time. See Note above about important changes. values List of values, corresponding to each item. One per line. Design Time. See Note above about important changes.